Winner of the Mobile Entertainment Of The Year Award 2010 ! Appadvice - Thumpies truly does reinvent the rhythm based game, and stands above Tap Tap Revenge, Rock Band, Riddim Ribbon, and all others in the category.Every single song is a joy to play and listen to. Technobrains - Thumpies delivers some intense fun that will keep you coming back again and again. Toucharcade - Thumpies is an amazingly creative game, and thanks to the multiple difficulty levels should be approachable enough for kids and challenging enough for adults. People are leaving absolutely glowing reviews of the game, and I find myself in agreement with all of them. Touchreviews - ..the whole game looks great with the just a position of the monsters and the butterflies being pulled off perfectly to create a musical game that will be loved by young and old a like. AppSpy - Thumpies is a fresh breath of air in the rhythm genre, that should appeal to all ages.The game is in a league of is own. Thumpies is a unique rhythm based music game for players of all ages. By correctly matching the beat of bouncing Thumpies, the player progresses through a song. If the player hits the targets in time, their Thump’o’meter slowly rises, but if the player misses or hits out of time, the meter falls. Unlike typical rhythm based games, Thumpies uses a mechanic of bouncing in time instead of just a series of notes. One way to describe Thumpies is a rhythm game crossed with juggling. 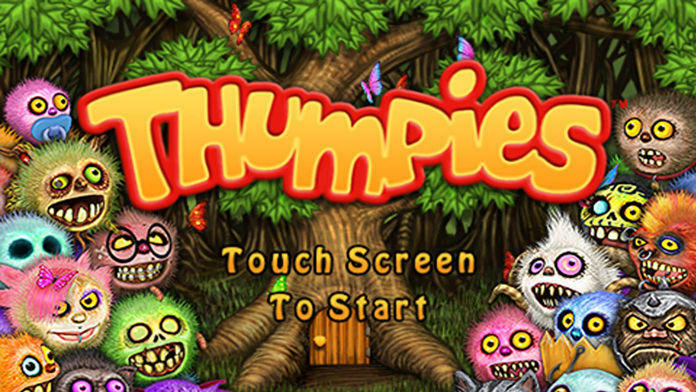 The quirky art design of Thumpies is accompanied by a unique musical score composed by award winning industry veteran David Kerr. The music was crafted with game play in mind giving the player a harmonizing experience. Players also have the chance to unlock progressively bizarre Thumpies by collecting different colored butterflies, that’s if the hungry Thumpies don’t eat them up on you first. Thumpies is a game that will keep people of all ages hooked with its addictive, quirky and stylistic gameplay. Join the Thumpies group on Facebook for more updates. Make sure you check our latest game - Fling a Thing! -new jukebox feature where you can play along with your favorite song!